Description: CSAO CA-11X gliding through Gloucester with a colorful set of power on the return trip to Pavonia yard in Camden. Description: NS rock train 556 is striking a beautiful fall foliage pose with the perfect leader to match the surrounding landscape as BNSF dash 9 pulls along with 3 other units into Enola Yard territory; seen from the famous "iron bridge"
Description: Creeping between a BNSF empty coal, and an auto train through the West Bottems headed for the Gooseneck. Description: A westbound manifest heads through the middle of Prairie du Chien. Description: Westbound manifest meeting an eastbound empty grain train. Description: Empty coal train meeting a westbound manifest. Description: BNSF 5478 and 3 other Dash 9's blast out of La Plata with a big J.B. Hunt stack train. 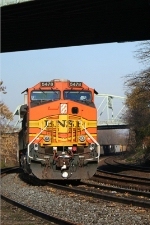 Title: BNSF 5478 Leads a WB Jb Hunt stack train!! Description: Almost all solid JB Hunt.